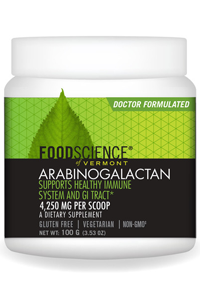 Arabinogalactan is a starch-like chemical found in many plants but found in the greatest concentrations in Larch trees. Larch arabinogalactan consists of water soluble polysaccharides and fibre and is used for many differing ailments. 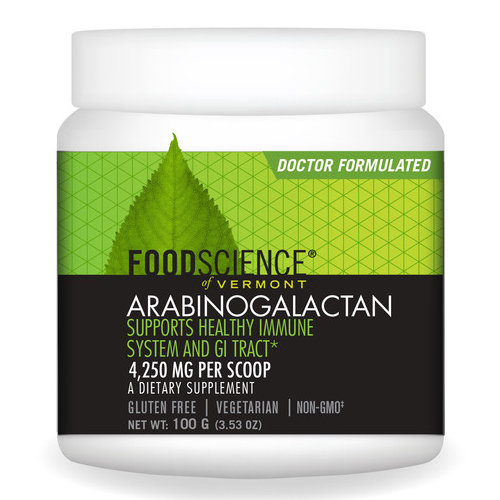 FoodScience of Vermont Arabinogalactan Powder is a vegetarian, gluten free and non-GMO food supplement. As a dietary supplement, mix 1 (5g) scoop daily in 8oz of juice or water. Daily amount can be divided between AM and PM. Store in a cool, dry place. If inner seal is broken, do not use.